Paleontology or palaeontology (from Greek: paleo, "ancient"; ontos, "being"; and logos, "knowledge") is the study of prehistoric life forms on Earth through the examination of plant and animal fossils. This includes the study of body fossils, tracks (ichnites), burrows, cast-off parts, fossilised feces (coprolites), palynomorphs and chemical residues. Because humans have encountered fossils for millennia, paleontology has a long history both before and after becoming formalized as a science. This article records significant discoveries and events related to paleontology that occurred or were published in the year 1876.
an hadrosaurid. The Two Clon Dinosaur. A junior synonym of Rhomaleosaurus zetlandicus. 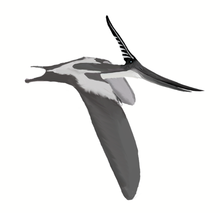 A Pterosaur with an antenna-like crest . An Crested Pterosaur, Erroneously known as "Pterodactyl"
255 Millions of years ago. 257 Millions of years ago. 251 Millions of years ago. 261 Millions of years ago. ^ Roger B. J. Benson, Hilary F. Ketchum, Leslie F. Noè and Marcela Gómez-Pérez (2011). "New information on Hauffiosaurus (Reptilia, Plesiosauria) based on a new species from the Alum Shale Member (Lower Toarcian: Lower Jurassic) of Yorkshire, UK". Palaeontology 54 (3): 547–571. doi:10.1111/j.1475-4983.2011.01044.x.